New Plus LAN data loggers: remote data access from any computer on your network using Ethernet connectivity. We are pleased to announce the launch of our new Plus LAN data loggers. Plus LAN loggers collect data automatically: they plug into a network point and send it directly for viewing in the Tinytag Explorer Connect software by any permitted user on a network. Loggers in the range monitor temperature, relative humidity, low voltage, current and count, and accompanying probes are available to suit a range of applications. 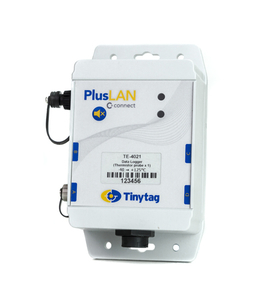 Plus LAN data loggers can be mixed and matched with Tinytag Plus Radio and Ultra Radio units within a system to meet particular site layout and infrastructure requirements. They are ideal for applications where radio signals may be problematic due to network range or physical obstructions, wherever a convenient network point is available. They are powered through their LAN connection using a plug-in Power over Ethernet (PoE) adaptor and have battery back-up for reliability if this should fail. As with the radio loggers, LAN loggers will also keep recording locally in the event of communications problems, and will transmit their data once the connection is restored. Tinytag Connect is a central data management feature for Tinytag Radio and LAN loggers giving users on a network remote access to data being recorded.